looking towards Ford and Devonport. 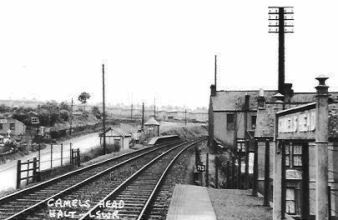 Camel's Head Halt was opened on Wednesday September 26th 1906 in connection with the London and South Western Railway's suburban service between Plymouth and Saint Budeaux for Saltash Railway Station. Children playing on railway lines was a problem even in 1906 and Camel's Head Halt was the scene of the first death since the opening of the new Halts in the Plymouth area. On Friday November 9th 1906 Master Stanley Martin, aged 8 years, of Third Avenue, Camel's Head, was seen playing on the line with his younger sister. Both were playing truant from Johnston Terrace Elementary School, unknown to their mother. Their father, Mr William Martin, was an engine-room artificer aboard HMS "New Zealand", which at the time was in Gibraltar. A witness, Mrs Sarah Smith, also of Third Avenue, saw the children playing on the platform. They were also seen by a ganger, Mr James Kingdon, who had ordered them off the platform. But they hid until he had gone home and came back again. When Mrs Smith heard a train approaching, she went to a window and saw Stanley underneath the platform and his sister running on the same line that the train was approaching on. Mr William T J Danning, the fireman on the 4.15pm train from Friary Station to Saint Budeaux Station, stated at the inquest that as the train was approaching the Halt he saw a little girl jump off the platform into the path of the train. Police Constable Rogers was passing nearby and was summoned to the scene, where he found that 6-years-old Miss Edna Gwendoline Martin had died due to a broken neck from colliding with the locomotive. When Constable Rogers went to inform Mrs Ida Rosina Martin of her daughter's death, he found her in a state of drunkeness, she having received money from her husband the previous Tuesday and had been drinking ever since. Doctor W Davis attended the little girl. The inquest jury returned a verdict of "Accidental Death". As from October 1st 1922 Down trains called at 8.58am; 12.08pm except Saturdays; 12.18pm Saturdays only; 1.07pm; 2.02pm; and 4.35pm. Between March 1st and September 30th there was an extra train at 5.17pm and between April 1st and September 30th another one at 7.23pm. Up trains towards Saint Budeaux called at 8.35am; 12.39pm; 1.20pm; 3.53pm; and 4.50pm. Between March 1st and September 30th there was an extra train at 6.40pm and between April 1st and September 30th another one at 6.23 in the morning. All trains were third class only. There was no Sunday service. The situation in March 1942, twenty years further on, was worse with only one Up train, the 1.22pm from Friary calling at 1.46pm although an extra one, the 12.10pm from Friary, called on Saturdays only at 12.32pm. Only one Down train to Plymouth called, the 8.11am from Bere Alston, which called at 8.28am. Although one would have thought that the apparent lack of passengers would have been a good enough reason for the Southern Railway Company to close it down but it was the fact that it had wooden platforms and that these posed a fire threat to local houses that brought the closure of Camel's Head Halt as from Sunday May 4th 1942. It is odd, though, that this was over a year after the big Blitz on Devonport so perhaps it was more of an excuse than a reason.